Relax whilst your furniture is being purchased and delivered with utmost care. Avoid frustration of finding a parking space or arranging delivery. Forget about having to lift those heavy, bulky and awkward boxes. Receive your items undamaged giving you peace of mind. Don’t worry about finding time to visit the store – we’ll do it for you. We can deliver and assemble the products for you. When you don’t have the time to get to your local IKEA store (or any other retailer shop) and require heavy or awkwardly large furniture items to be delivered and assembled – then this personalised service is designed with you in mind. Simply ask us to become your in-store Personal Shopper and forget about those hassles of searching for that ideal parking space, or standing in long register queues for what may often seem to feel like hours. We visit the store for you, purchase the items you have requested, and then deliver and assemble them in your home, store or office at a time that suits you. Simply pay us the cost of the purchased items plus our personal shopper delivery and assembly fees. When you find the items you want, whether it is online or within a current catalogue, simply email us your enquiry else use our dedicated IKEA ORDER FORM. 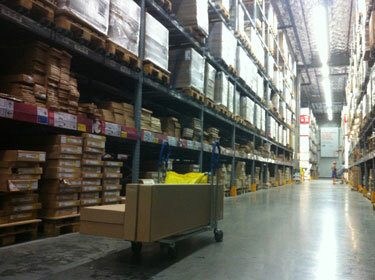 Transfer the IKEA product details into our form and submit it to us. We will require you to provide us with the product article number, description, quantities required, colour, price, and if items are on promotional special (when applicable). Alternatively, you can simply CONTACT our office on 02 9544 9222 during general business hours and convey your order. We will then proceed to contact the store to ensure stock is readily available, and then arrange a convenient time with you to deliver the purchased items and confirm our service fees. When you know which IKEA products you want to purchase, whether it is shown online or within a current catalogue, simply use our IKEA ORDER FORM. Transfer the IKEA product details into our form and submit it to us. We will require you to provide us with the product article number, description, quantity required, colour, price, and if items are on promotional special (when applicable). Alternatively, you can simply CONTACT our office on 02 9544 9222 during general business hours and convey your order. We require an upfront payment representing the total value of the goods as confirmation of your order to proceed. The retailer’s standard refund policy applies at all times, and cancellation of orders will not be accepted unless confirmed and accepted in writing by an authorised representative of Getit Assembled. The cost of our provided services is collected at completion of assembling the items purchased on your behalf. Our staff are authorised to collect cash, and some of our teams carry a MobiPOS facility. Cheque and electronic bank transfers are also accepted at our firm’s discretion. Fee is for our firm to visit the store, purchase goods on your behalf and safely deliver into your premise (i.e. vehicle arrival at premise). Assembly labour occurs thereafter, which includes time taken to unload and carry individual items into designated room(s) of premise. We add a handling charge of $15 per additional item that costs more than $30 for Items 4 onwards. All prices include goods and services tax (GST). Currently we offer a full service for the whole Sydney metropolitan region and its extended outskirts. We are working towards extending our services into both Brisbane and Melbourne metropolitan regions.